I’m seriously considering commissioning a time and motion study to get to the bottom of this issue. There have to be efficiencies that can be applied to the current processes – Marco Pierre White would lose his mind if he saw Crazy Cat Boy cook! I’m standing in our kitchen surrounded by an inconceivably large mess that produced a single dinner for two last night. Stains I don’t recognise spread across the floor (I’m ignoring the larger bits of ‘stuff”, I leave them for the cats to clean up so they aren’t my problem), there are brightly colour dribbles down every cupboard. Weird spices coat the bits of the bench, sink and cooktop that I can see past the truly staggering number of utensils, plates, chopping boards and saucepans that clutter every available surface. I don’t understand! 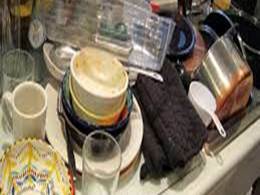 The dishwasher is right there and it’s empty, why not put the dirty stuff in there when you’re done with it? Every knife has been used; why must he use every knife? Once clean tea towels are caked with god knows what. Why is it always the good tea towels that he uses, why not the ratty old ones that I hang right next to them?! Soaking doesn’t work; they never look the same again. The kicker is that the one who cooks doesn’t clean in our house. There is no incentive for him to change anything in his creative process. One of the younger cats jumps lightly up on to a slightly less crowed part of the bench and gives me a look that says “There’s nothing good left up here, I checked last night”. The older cat licks a random patch of floor hoping for a find, he’ll probably have success judging from the looks of all this. With a resigned sigh I pull on rubber gloves and start the recovery process…. I really shouldn’t complain. I do cook, but I don’t enjoy it and he does. My major contribution to keeping us fed is to suggest that wine might be nice and grabbing the glasses out. Apart from the colossal mess, the system works for us.